To paraphrase Ron Burgundy: it’s kind of a big deal. For a certain flavor of geek, anyway. When I started my editing career a few years ago, Chicago was on its 16th edition. At one point I read it cover to cover (well, mostly) and took careful notes. After all, I was brand-new to the field and had no formal training. I wanted to get it right. 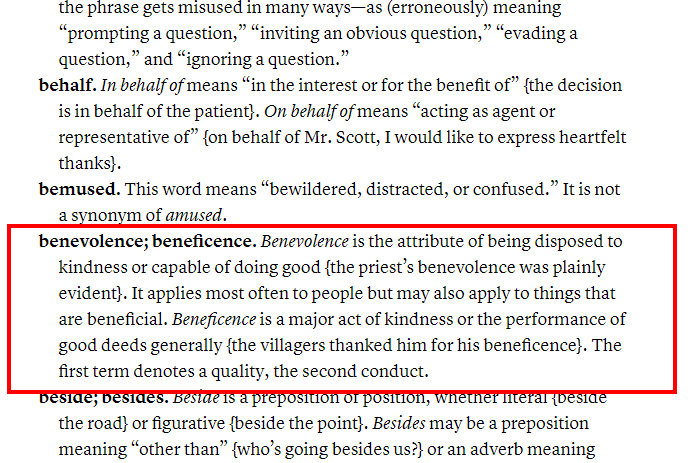 You can click the screenshot to enlarge, but the gist is that beneficence is a tendency (in a person) to do good, whereas benevolence is the act of performing a good deed. Intention vs. action, in other words. My prior understanding of these words was a bit fuzzy, so I had no reason to doubt the wisdom of Chicago. I did, however, notice something odd. A later entry states that maleficent means evil in deed, whereas malevolent means evil in mind. This is odd because you’d expect the “good” words and the “bad” words to be parallel; you’d expect -evolent and -eficent to mean the same thing in both. But they’re switched. Puzzled by this apparent inconsistency, I checked my dictionary. And then another dictionary. And Garner’s Modern American Usage. And every other source I could find. They all said the same thing: the “good” and “bad” words were, in fact, parallel, just as you’d expect. Chicago was wrong. 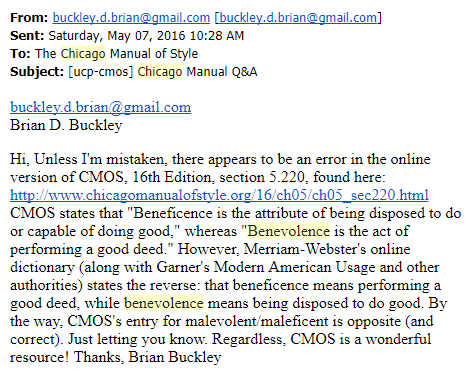 They had gotten benevolence and beneficence mixed up. I was stunned. And kind of excited. Had I really found an error in the big C? To be sure, it was better formatted when I sent it. The line breaks and such apparently got lost somewhere along the road. Taking pride in things like this is strange, because on the one hand, it’s really exciting, but on the other hand, the set of people who will be excited with you when you tell them the story is relatively small. But y’all are pretty cool. I think you’ll pick up what I’m throwing down. After all — that’s what the internet is for, right? You are so badass. So really monumentally badass. So very hugely awesome. We’re all really impressed over here, I can tell you. A lot of very smart people have been saying that. They’re calling me and saying it’s the biggest update to a style guide, maybe ever. The failing AP Stylebook is jealous big league. Sad! 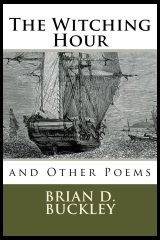 Well, I would certainly brag, in your shoes. Good work. My father once got a letter of apology from an editor at the NY Times, for the way an article was written. He (my father) tried to be cool about it, but he was pretty proud, too. That’s cool! 😀 My dad once got a letter from the IRS admitting they were wrong about his taxes. I told him he should frame it.